If ever there was a need for sunny décor, it is in a sociable place such as a living room. Bring the sunshine in and give your living room an inner glow with our Bronte Lemon wallpaper. While pale yellows are often associated with the summer months, this design offers contemporary style all year round. Soft and romantic, this floral design works well with neutrals but also lends itself to pops of bright colours too. If you are experimenting with yellow for the first time, a muted shade like this is a great starting point. When it comes to the bedroom, we recommend deeper yellow tones such as mustard and honey tones. Mixing yellow with gold shades makes it more of a neutral and therefore it is easier to incorporate into your existing décor. 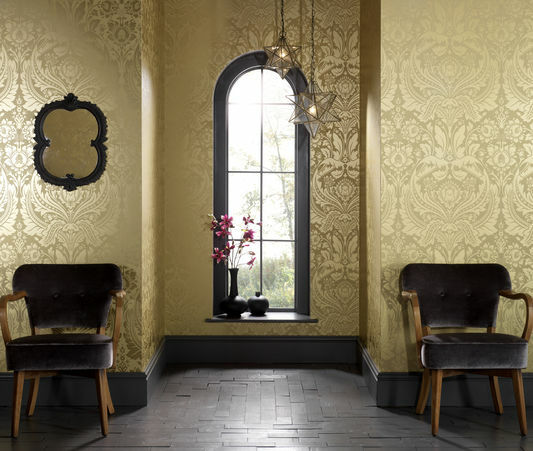 If you are experimenting with yellow in a traditional setting, our Desire Gold and Mustard wallpaper is a superb option. With rich gold tones and a damask print, it doesn’t get more decadent than this. If you prefer something more feminine, our Asian inspired Chinoiserie Imperial yellow wallpaper will brighten up any bedroom with its floral appliques. Yellow can be used to create a focal point and this works wonderfully in a kitchen. 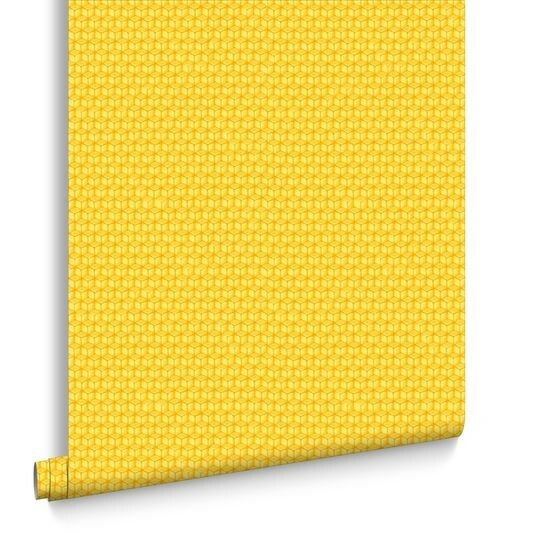 Create a bright breakfast nook with our sought-after Honeycomb Honey wallpaper. Use it on one wall to create a statement feature and transform a dreary kitchen into something bright and beautiful. This design is both timeless and trendy and would lend itself to a modern space as it has some real staying power. The honey tones add warmth to a space and this is important when decorating a room such as a kitchen as lighter tones can look a little clinical. Decorating with yellow is simple as there is a tone to suit every preference. From bright and breezy to timeless and traditional, we have a yellow wallpaper design to complement your home.